You may have noticed over the past year there is a formal dance underway between the Department of Justice and the Congressional oversight committees over release of documents related to the 2016 election and the multiple investigations it spawned. Congress requests documents, and the DOJ then spends months dragging it’s feet before responding. The department then often refuses to hand over what’s requested, or only does so in a highly redacted form. 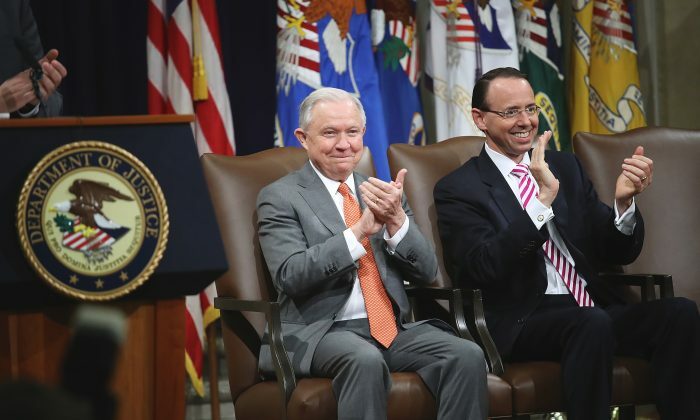 As this process has dragged on, a popular narrative has arisen in which Attorney General Jeff Sessions and Rod Rosenstein, second in command at the DOJ, are both part of a plot to remove President Donald Trump from office. To keep this plot going to try to remove Trump from office, Rosenstein has to hide from Congressional Oversight the documents used to launch “Crossfire Hurricane,” the FBI counterintelligence probe targeting the Trump campaign team, until Mueller can successfully drive Trump from office. It’s a nice theory until you examine it closely. Allow me to provide you with an alternative narrative. In this alternative narrative, Trump & his team enter office in January 2017 already knowing all about the Crossfire Hurricane plot to spy on his campaign. Not only did Trump and his team know about the plot, they already had a counterintelligence strategy in place to fight back against it. In this narrative, all the top members of Trump’s team, from CIA Director Mike Pompeo to Attorney General Jeff Sessions not only know about the plot, they are fully read into the strategy to counter it. The people coming in to run those law enforcement and intelligence agencies aren’t being taken by surprise; they went in knowing what they’d find and what they would have to do. Far from immediately confronting all the plotters and rounding them up in the spring of last year, which would’ve caused massive shock and upheaval, Trump’s inner circle of advisers decided on a slow rollout strategy that would preserve and protect the institutions these saboteurs had corrupted while individual plotters were slowly and inexorably exposed and then forced out. After all, at the end of this, you still need a functioning DOJ, FBI, CIA and State Department and so on. You have to separate all the “bad eggs” from the “good eggs” without killing the chickens and burning down the farm. What some people fail to notice or understand, is that some of the plotters don’t reside inside the DOJ or the State Department. They’re inside the U.S. Congress. They are Senators, members of the House Representatives, or key Congressional staff, such as the recently indicted James Wolfe, longtime director of security at the Senate intelligence committee. This means a lot of what you’ve been seeing on the surface for the past year-and-a-half is not real. Such as Trump railing at Sessions on his Twitter, or demanding Rosenstein “do something!” It’s disinformation crafted to hide what’s actually been going on. Because the people now running the DOJ can’t hand over material evidence until the investigations are completed. They especially can’t hand over this evidence to the very people who are being investigated. This is why Rosenstein has had the most thankless job in America for the past year and a half. Both Rosenstein and Sessions have all but used signal flags to strongly hint that members of Congress who sit on these Oversight Committees are targets of criminal investigations. Rosenstein keeps being asked to hand over material evidence to Congressional oversight committees at the same time that his department is investigating several members of these selfsame committees for criminal leaks of classified information, as well as their involvement in the Crossfire Hurricane shenanigans. So he’s being asked to hand over evidence that’s being used to investigate several members of Congress to those selfsame members of Congress. See what a no-win scenario that is? No prosecutor could possibly hand over material evidence to the very people being targeted by the federal investigations he’s overseeing. That’s not how these things work. You don’t just hand over the evidence that makes up your case to the people you’re investigating. Until they are ready to move, Sessions and Rosenstein have to keep most of this evidence in these documents under wraps. They won’t hand over the really vital stuff implicating people at the top until the leakers in Congress and elsewhere are in no position to use that evidence to try to save themselves or their political masters.